Obesity is the most common nutritional disorder, that isn't only restricted to the west now. The condition is characterized by excessive deposition of fat in the body which usually results from consumption of food in excess. Millions of rupees are spent every year on weight loss programs and in most cases there is a strong tendency to regain weight. Obese children are often referred to as "chubby". The best way to determine if your child is suffering from obesity is to call a child-specialist doctor and have him diagnose your child. Now, children naturally have higher levels of fat than adults, what is often referred to in layman's terms as "baby fat", and this is perfectly natural. However, obesity is often accompanied by several other factors such as, chronic hunger, lethargy, and poor physical coordination. The best way to treat childhood obesity is not by singling out the child's problems. That would only work to his and your disadvantage. At his age, your child still doesn't have the maturity to understand and accept weight loss needs and goals. Furthermore, medical professionals do not advocate strict dieting for children either. If you want to help your child overcome his weight problems at an early stage, the whole family must be prepared to tackle it together immediately. As it always is with solving problems, there is no better time to find a solution than doing so now. Delays will only increase the risk of having your child's weight problems worsen. If you want to help your child, you need to take action without delay! Discuss with your partner how to best introduce changes to the family's lifestyle and eating habits. Do not underestimate your child's intelligence. If you are not careful, it would be easy for your other kids to catch on with what you're doing and blame their sibling for causing all these changes in their lives. It's very important that you introduce changes gradually and emphasize it's benefits for the whole family. It is crucial that all of your kids, even the one struggling with weight problems, does not realize what really triggered these changes. Make a chart of the food you commonly eat every day. Consult a nutritionist or a physician and show this chart. She or he will let you know what you're doing right and what you should change for everyone's betterment. Parents are the first and best role models children could ever have. If you have decided upon the changes, be prepared to follow them to the letter. If you can't, don't expect your kids to do otherwise. Subject your fridge and pantry to seasonal cleaning. Gradually replace unhealthy foods with healthy but nonetheless delicious alternatives. Do it one by one so your kids wouldn't feel completely deprived of it. Taking away all their favorite goodies in one instance will only make them crave it more. And do leave some of the "fun stuff" behind. They're not altogether bad to consume if you can monitor your child's intake of it. Revise your meals. Start with breakfast. Instead of piling on the butter and honey for pancakes, give them healthier substitutes. Make the effort to search for fruits that would appeal to your kids' taste buds. Move on to lunch and dinner when your kids have adjusted to eating healthy breakfast. Don't allow your kids to get used to having snacks any time they want. This is one of the major causes for them to overeat and develop weight problems. Work out a timetable for them. They'll catch up soon on the times when they can expect treats and snacks, and they'll automatically adjust their activities around your schedule. Snacks should include at least two food groups for variety and better health benefits. You'll find a lot of simple and easy recipes on several websites available online to make snacks for your kids more fun and delicious without going over your budget. Discourage your children from eating while watching TV. If they are completely engrossed with what they're watching, they wouldn't notice the amount of food they're eating and this could also lead to weight problems. If they want to eat, have them eat at the dining table, preferably with you or other members of the family. Eating is a great way to bond together, after all! Make small but significant changes to your lifestyle. To increase physical activity for your kids, assign them to tackle simple household tasks and emphasize the need for being responsible. Use sports and other physical activities as a way for the whole family to exercise together as well. One of the simplest causes of obesity is, ironically, rooted in a parent's misplaced love for their child. No one wants their kids to be undernourished; yet in a mistaken effort to overcompensate, sometimes parents end up feeding their children a ton of healthy food. The problem here is that children need a certain amount of nutrition every day to grow up healthy; anything beyond this limit is stored in their bodies as excess weight. Another common factor leading to obesity in kids is the sheer amount of unhealthy junk food around the world today. Given their often-busy schedules, parents usually let their children gorge on fast foods. While these comprise meals in the sense that they keep people from starving, these types of meals are loaded with empty calories that children's bodies are unable to fully process and again, end up storing the excess as fat. 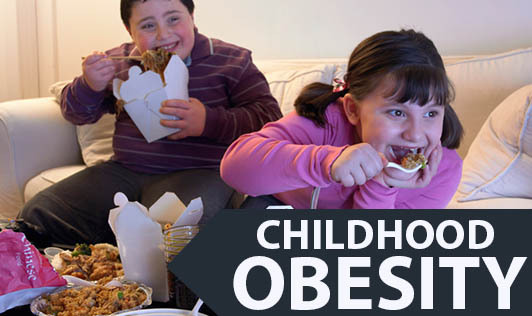 Why Child Obesity is Skyrocketing? Kids in the current generation are actually suffering from way too much cosseting. Toys should be "safe", sports kept at a minimum of roughness and injury. "Violent" toys are "bad". Hurray! End result? The kids don't get enough exercise at a point in their lives when their activity levels determine how their bodies will be formed for the rest of their lives. The next generations are all couch potatoes in training at this rate. Then we offer the easy availability of video games and TV. The next culprit down the line is one that we all know and love to hate. Or hate to love. Junk food like potato chips, ice cream, greasy cheeseburgers, overstuffed pizzas, and everything else related to them. While indulging in them on occasion is okay, no one in their right mind would want to live on a constant diet of junk food. Unfortunately, instead of the old family tradition of packing your kid a healthy lunch to take to school, too many modern day parents just give their kids some cash to buy lunch at the cafeteria. These kids end up overloading on junk food, since you're not there to watch what they eat. Remember, you can FORCE your kids to eat right, but when you're not around they will always gravitate towards the fried and appetizing food. This is something that is difficult to avoid sometimes, but any responsible parent should take time out to cook a right meal for their kids. The sad part about most modern parents is either a total lack of culinary skills, lack of nutritional knowledge, or most commonly just not enough time to cook, ending in that same result of eating fast foods. While fast foods are great for parties, living on them is definitely not a good idea. And for those who do not opt for these, they settle for "quick and easy" meals like instant noodles and microwaveable ready-made food. * Grease, Salt, and Sugar Everywhere! We all know that these three factors are yummy but bad for us if we take too much. Unfortunately, considering the environment of your average school kid these days, access to foods high in these ingredients is inevitable. While our kids may only still be eating three regular meals a day, they are probably snatching a quick bite or drink at every break they get, as well as before and after school. This is especially true for kids because snacks are habit-forming, and kids are psychologically more prone to developing habits than adults. These little snacks can amount to the calorific value of a fourth or even fifth meal a day, AND they're composed almost completely of all those wonderful empty calories with absolutely no nutritional value whatsoever.